Home - What is an iAM Band? Knowing what surf level you’re at can be quite a difficult to gage, especially if you spend a lot of time out there free surfing without instruction. This in turn makes your progression ever more difficult and you can often plateau unsure how to reach the next level. We reckon that surfing is a journey of ongoing progression. No wave is ever the same and the conditions are unpredictable making it an everchanging sport. Our instructors love being part of that journey and each lesson we teach uses the structure of the iAM Bands system in order to give surfers a band at which their surfing is currently at and set them targets to reach the next surf level. So what is the iAM Bands System? 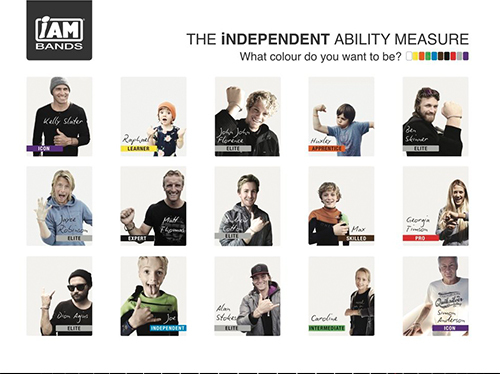 The iAM Band System stands for a Independent Ability Measure and was pioneered by professional surfer Sam Lamiroy who works with us coaching our school groups and taking intermediate and advanced surf coaching. 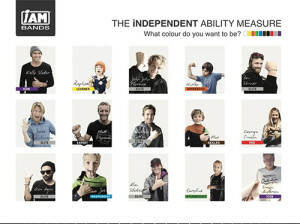 It uses a system of 10 different colours to represent a given level of ability within surfing. We use it in every lesson to give you guys an idea of where you surfing is and where it could be. Our surf school in Perranporth is an accredited iAM assessment centre so get down here for a surf lesson with one of our instructors who can assess you and give you your band! You can register your iAM band level online in order to track your surfing journey and can even buy an iAM band which you can wear with pride and show off to all your mates. 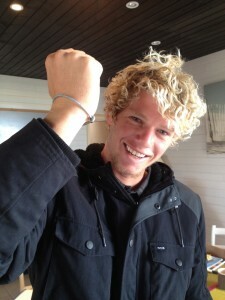 2016 World Champion John John Florence stoke with his Grey iAM Band. 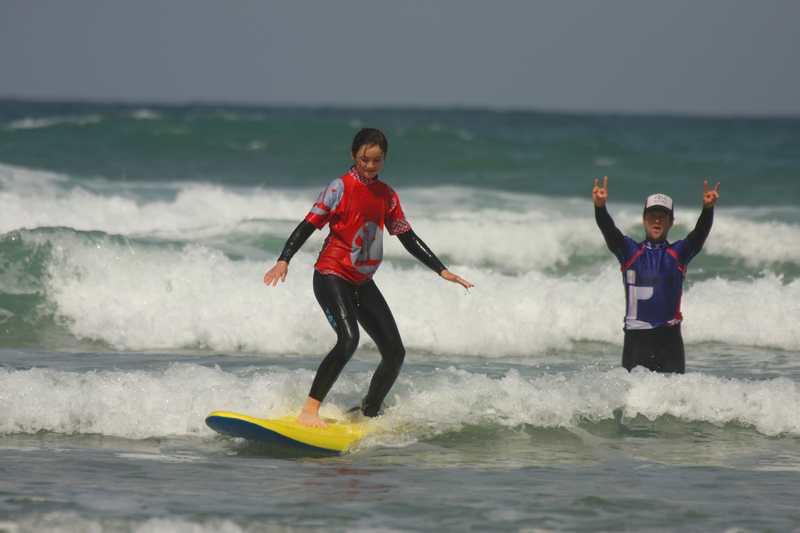 This surfer has successfully taken part in an introductory surfing session. They have been briefed by the potential hazards they could face while surfing. Here is Elle having her first surf lesson. Successfully completing 2 hours session has awarded her a white band. This surfer can catch their own white water wave and stand on the board in control for 3 seconds or more without assistance. Elle progressed very quickly and jumped onto her yellow band after coaching at our surf school. This chicka was making turns left and ride by the end of her course of lessons with us. ORANGE! This surfer can without assistance, catch and can traverse across small (under head height) unbroken (green) waves in BOTH directions (forehand and backhand) completing the wave in control. This surfer can complete ANY 1 of the following maneuovers during a full coaching session (up to 2 hours): Off the top/lip, Cutback, Floater, Re-entry, On a longboard Cross step to hang 5. Surf School Instructor Jeffa is a blue iAM Band surfer. This surfer can successfully complete 1 of the following maneouvers as selected by the instructor, given only 3 waves. Off the top/lip, Cutback, Floater, Re-entry, On a longboard Cross step to hang 5. Being able to cross step to hang 5, like Sarah, can earn you a brown iAM Band if completed given only 3 waves. This surfer can successfully complete 2 of the following maneouvers as selected by the instructor on 1 wave given only 3 waves: Off the top/lip, Cutback, Floater, Re-entry, On a longboard Cross step to hang 5. Our Master of Stoke Max Hepworth-Povey is a black iAM Band. This surfer has competed on a national level and placed in the TOP 16 in a national OPEN ranking (no age restriction) surfing event. They are or have been a full time professional and are a household name in national surfing. Sam Lamiroy is a Grey iAM surf level, having previously competed internationally. Sam Lamiroy, pioneer of the iAM Bands is a grey band. This surfer has proven to be an international icon, multiple world champion or pioneer. They have inspired generation and changed the course of surfing. Kelly Slater is the 11 x world champion and has inspired a generation to get into competitive surfing. Are you a Green iAM Band or above? Join us for Pro Surf Coaching! If you’re a green iAM Band Level or above then we recommend attending our intermediate to advanced coaching days with Sam Lamiroy taking place over the summer! Book online here! The session will involve coaching from Sam himself followed by video analysis in order to breakdown your surfing bit by bit. If you fancy a lesson with us in which you will be given an iAM Band level then call us on 01872 888 840 or check out our website.